ISIS’s resurgence in Iraq has impacted the dynamics of the Syrian civil war, changing the strategic and operational calculus of regime, opposition, and ISIS forces fighting in Syria. 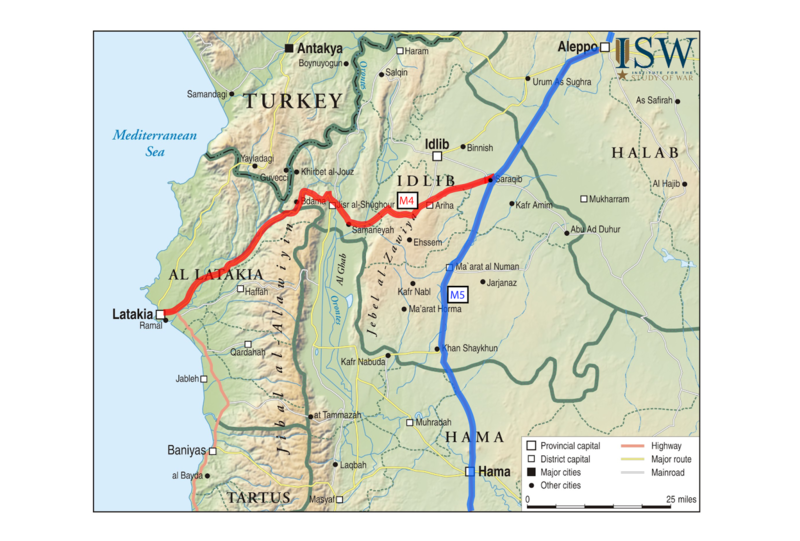 In the late spring of 2014, regime forces concentrated efforts on Aleppo city and Deraa province leaving critical infrastructure in Idlib province unguarded and vulnerable. Rebel operations during this period demonstrate opposition forces’ ability to exploit regime weaknesses, and conduct coordinated offensives indicating organization above a tactical level. Opposition operations set a baseline for rebel activity against the regime. From this baseline, it will be important to assess how opposition groups in north-western Syria contend with the emerging three-front war in Syria. In the spring and early summer of 2014, opposition forces targeted the regime’s logistics system and made significant advances in the province of Idlib. Rebel operations have continued to target the vital highways segmenting Idlib province, namely the M5 and the M4. 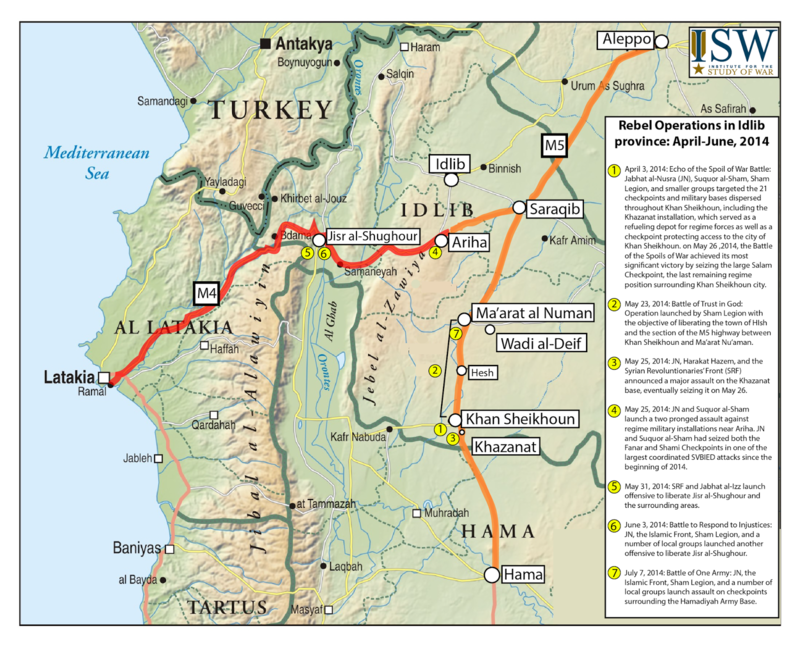 The M5, which spans the wm5estern length of Syria from Damascus to Aleppo, is an essential supply route for both regime and opposition forces. Likewise the M4, which connects Aleppo and Idlib to the coast of Latakia, is indispensable for regime forces currently fighting in Aleppo City. Prior to the rebel offensive in Khan Sheikhoun, smaller shaping operations focused on liberating checkpoints along the M5 strip between Khan Sheikhoun and Ma’arat Nu’man. Checkpoints in the small town of Hesh and the Wadi al-Deif Military Complex in Ma’arat Nu’man remained obstacles to rebel operations. Seizing these key waypoints along the M5 strip allowed rebel forces significant freedom of movement along the route and prevented regime forces from reinforcing areas of Khan Sheikhoun. On May 16, 2014, ten days before the final assault on Khan Sheikhoun, Suqour al-Sham and Sham Legion attacked the Wadi al-Deif military base located in the eastern outskirts of Ma’arat Nu’man with an impressive underground explosive. The tactic of using tunnels to emplace explosives under strategic regime positions has been utilized throughout the country to target hard-to-reach regime positions. On this occasion, fighters of Suquor al-Sham and Sham Legion dug an 850 meter tunnel leading to the western gate of the Wadi al-Deif military complex. Fighters then filled the cavern located under the base with what they claimed was 60 tons of homemade explosives. The successful detonation destroyed the western entrance of the base completely, and rebel fighters announced killing nearly one hundred regime soldiers. On May 23, 2014, Sham Legion announced the “Battle of Trust in God” with the objective of liberating the town of Hesh and the sector of the M5 between Khan Sheikhoun and Ma’arat Nu’aman. Elements involved in the battle included the Syrian Muslim Brotherhood-linked Sham Legion, Suqour al-Ghab, the Islamic Front, the Syrian Revolutionaries’ Front (SRF), and a number of smaller local groups. As a large waypoint along the M5 highway between northern Hama and southern Idlib, Khan Sheikhoun is of strategic importance for both regime and rebel forces. The town has been the site of fierce clashes since the regime first drove rebels out of the town in the summer of 2012. Seizing Khan Sheikhoun allows the rebels to control a greater stretch of the M5 highway, further choking the regime’s ability to use the road as a supply route. It would also pave the way for an offensive to seize the major regime base at Wadi al-Deif, near Ma’arat al-Nu’man. Although the assault on Khan Sheikhoun only gained social media prominence as it approached its culmination, the offensive began mid-Spring. 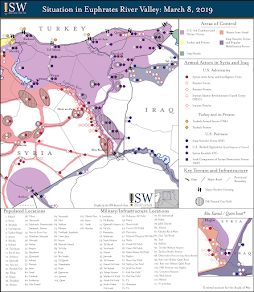 Beginning on April 3, 2014, ten rebel groups including al-Qaeda affiliate Jabhat al-Nusra (JN), Islamic Front member Suqour al-Sham, Sham Legion, and a number of smaller Free Syrian Army (FSA)-aligned groups announced the “Echo of the Spoils of War Battle” in an effort to capture Khan Sheikhoun and the surrounding strip of the M5 highway. Like the rebel offensive in Hesh led by the Islamic Front and Sham Legion, the “Echo of the Spoils of War Battle” was in part led by the Islamic Front’s Suqour al-Sham, as well as Sham Legion. This indicates that the “Battle of Trust in God” was likely a coordinated shaping operation ahead of the Khan Sheikhoun offensive meant to prevent regime reinforcements from reaching the town from the north. The offensive targeted the 21 checkpoints and military bases dispersed throughout Khan Sheikhoun, including the Khazanat Military Base, which served as a refueling depot for regime forces as well as a checkpoint protecting access to the city of Khan Sheikhoun. By April 15, 2014, the groups participating in the offensive announced they had seized al-Busaliya, al-Siad, and al-Misbah checkpoints, located in the southwestern sector of Khan Sheikhoun. More than a month later, on May 25, 2014, a new operations room including JN as well as Western-backed groups Harakat Hazm and the Syrian Revolutionaries’ Front also announced a major assault on the Khazanat Military Base, an objective included in the “Echo of the Spoils of War Battle.” This assault on Khazanat Military Base was initiated at around 12:00 pm on May 25 by what participants named the “Mutual Consultation” operations room. According to a detailed statement of the raid released by JN, fighters advanced from the north and east, taking up positions in a number of buildings dispersed among orchards 1 kilometer north of the base, while fighters made their way along the base’s access road to flank it from the west. Later in the afternoon, JN fighters detonated two Suicide Vehicle-Borne Improvised Explosive Devices (SVBIEDs) that targeted regime positions around the perimeter of the base. Following the explosions, a raiding unit entered and eventually seized the base later that night. The following day, the “Echo of the Spoils of War Battle” achieved victory by seizing the large Salam Checkpoint, the last remaining regime position in the vicinity of Khan Sheikhoun city. Regime forces responded in the following days by dropping a number of barrel bombs on the Khazanat Military Base, as well as the Salam checkpoint. Activists on the ground believed a number of explosive barrels dropped on the area contained poisonous gas. By the end of May 26, following the fall of both the Salam checkpoint and the Khazanat Military Base, Khan Sheikhoun was completely controlled by opposition groups, and activists uploaded multiple videos showing rebel convoys entering the city itself. On May 25, the same day as the attack on Khan Sheikhoun, JN and Suqour al-Sham launched a two-pronged assault on the southern Ariha hills with the objective of seizing two military installations. The Fanar Restaurant Checkpoint and the Shami Military Installation sit atop two peaks in the area south of the town and control access to the southern neighborhoods of Ariha via two access roads. At 6 in the morning, JN with support from Suquor al-Sham detonated four SVBIEDs against regime infrastructure targets. All four SVBIEDs exploded in the Jabal al-Arbaeen area on the southern outskirts of Ariha. The first SVBIED, driven by Moner Mohammad Abu Salha, a 22-year-old American man from Florida, approached the Fanar Restaurant Checkpoint from the southwest along a dirt road. The 16 ton armored truck completely destroyed the checkpoint and caused it to crumble on itself, leaving only few survivors to defend it. Over the course of the battle, two more SVBIEDs exploded to the west of Fanar, targeting the Shami Military Complex. The first two SVBIEDs targeted the Commander’s building and Shami Checkpoint. One final VBIED targeted the Aram building, however the driver of the VBIED was able to park his vehicle and escape uninjured. The four explosions were followed by a barrage of artillery and gunfire. By the end of the day JN and Suquor al-Sham had seized both the Fanar and Shami Checkpoints in one of the largest coordinated SVBIED attacks since the beginning of 2014. Rebels led by JN and Suquor al-Sham thus gained access to Ariha, a key town situated in the Jabal al-Arba’een region of Idlib which rebels briefly seized in the fall of 2013. The M4 passes through Ariha before connecting with the M5 in Saraqib. Controlling the section of the M4 in Ariha allows opposition forces to cut off regime ground supply leaving Latakia destined for Idlib or Aleppo cities. There is no clear evidence the two offensives were coordinated, however the presence of JN in both cases as well as the nearly simultaneous timing of the two operations strongly suggests a correlated effort. Taking advantage of the recent momentum, JN, the Islamic Front, Sham Legion, and a number of local groups founded a new operations room on June 3, 2014, focusing on the area of Jisr al-Shughour. The operations room, formed to coordinate “The Battle to Respond to Injustices” also released a charter document containing a list of provisions to which all elements of the operations room were to adhere. Items include rules dictating the division of spoils through an Islamic court as well as strict guidelines for disseminating information about offensive. 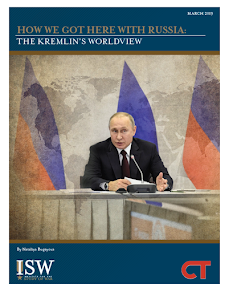 Despite the high profile of groups participating in the room and the existence of a charter document, as of mid-June little information had been disseminated about the group through its official Facebook page, either due to the strict operational security emphasized in the group’s charter, or simply due to their lack of engagement in operations. While the largest effort on Jisr al-Shughour was directed through the “Battle to Respond to Injustices” operations room, other groups including the SRF and local group Jabhat al-Izz announced their own effort, perhaps to avoid association with JN. Initiated on May 31, 2014, “The Battle of the Passageway” had the objective of liberating Jisr al-Shughour and the surrounding area by destroying regime checkpoints positioned around the town. The battle began with rebels firing mortar rounds into Jisr al-Shughour city, some of which reportedly fell on the National Hospital checkpoint near the southern entrance of Jisr al-Shugour and injured a number of civilians. The regime’s seizure of the Kassab border crossing in the end of April, a move that effectively ended the rebels’ offensive on the Latakia coast, appears to have also reversed rebel momentum around Jisr al-Shughour and the M4. On June 15, a statement purportedly from JN said that JN fighters would have to withdraw from the operations room entirely because they needed to allocate fighters to other higher priority areas. Moreover, due to alleged civilians casualties caused by rebel shelling, activists in Idlib have called on opposition fighters to end the Passageway offensive being waged by the SRF and Jabhat al-Izz. After a brief respite of intense clashes surrounding Ma’arat Nu’man, rebel progression in Idilb continued in early July focusing on the area surrounding the Hamidiyah Army Base, southwest of Ma’arat Nu’man. Tha Hamidiyah Army Base is located along the M5 highway, limiting access to and from Ma’arat Nu’man from southern Khan Sheikhoun. 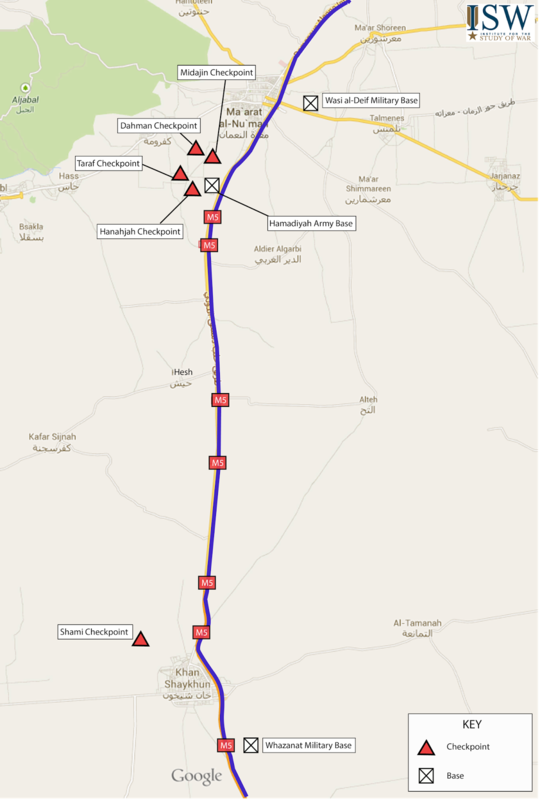 Immediately west of the army base are four checkpoints: Hanajak, Tafar, Dahman, and al-Midajin Checkpoints form an arc, insulating Hamadiyah Army Base from the west to the north. On July 7, Islamic Front forces, supported by an SRF-aligned rebel group named Liwa al-Maghawir raided the Taraf Checkpoint southwest of the Hamadiyah Army Base as part of an operation entitled “The Battle of One Army.” After targeting a number of regime tanks with TOW missiles, opposition forces approached the checkpoint using the surrounding orchards to cover their advance. After navigating through minefields surrounding the checkpoints, fighters reached the checkpoint’s earthen walls. Following clashes with regime forces, fighters entered the position and seized a number of T-55 tanks. After seizing the checkpoint, opposition forces used it as a staging point to continue their offensive northwest toward the Dahman checkpoint, before completely razing the buildings within to prevent the regime from reoccupying them. Days after the fall of the checkpoint, opposition forces continued to target regime armor in the vicinity with TOW missiles. Opposition forces continued 600 meters north towards the Dahman checkpoint located northwest of the Hamadiyah Army Base. Clashes between IF, Filq al-Sham, and other SRF-aligned brigades led to opposition fighters seizing the Dahman checkpoint from regime forces. After capturing the checkpoint and a quantity of supplies inside, fighters destroyed buildings inside, again in an attempt to prevent regime forces from reoccupying the position. On July 16, JN, Filq al-Sham, as well as smaller SRF groups attacked the al-Midajin Checkpoint located north of the Hamadiyah Army Base and the smaller, Hanajak checkpoint located immediately west of the Hamadiyah Army Base. JN published an image showing the al-Midajin and Hanajak Checkpoints along the front lines of opposition force’s advance towards the Hamadiyah Army Base. Hanajak fell to opposition forces with little resistance. Clashes continue between opposition and regime forces as rebels attempt to continue their advance towards the Hamidiyah Army Base. The late spring and early summer rebel advances in Idlib province indicate that opposition forces have the ability to coordinate large scale offenses over relatively large swaths of territory. The initial Idlib offensive on the M5 around Khan Sheikhoun began with a combined assault over a distance of 45km on a single day. Such an operational range demonstrates that opposition forces are able to coordinate effectively at above a tactical level. In mid-July regime forces clashed violently with rebel groups in the town of Morek, located in northern Hama province, in an attempt to seize the town from rebel forces. Regime soldiers stormed the town under the cover of airstrikes and clashed violently with members of the Islamic Front, local opposition brigades, and Jabhat al-Nusra. The regime offensive is likely a move to reinforce strategic locations along the strip of highway that passes through Idilb province. As regime forces attempt to advance northward, rebels will also have to contend with the threat of the Islamic State of Iraq and al-Sham, bearing down on them from parts of Aleppo province.